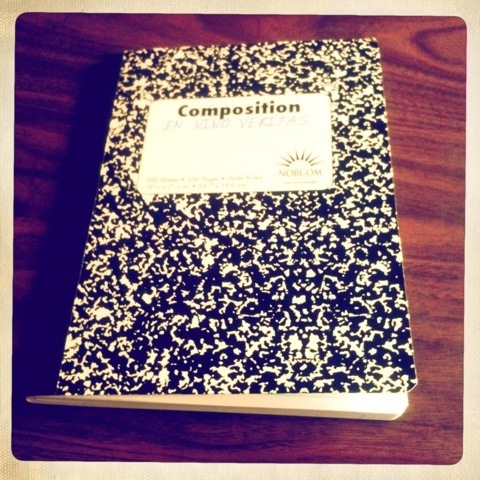 The lowly school composition book, the simple tool that has been used by so many. A few days ago I picked up a $1 marbled composition book to record the progress of a current project, and upon picking it up, I was flooded with memories, it brought me back to my school days. That black and white marbled cover and familiar size, the single signature of pages, and the cheap, but sturdy construction is unchanged in the 15 years since I last held one. I have been into the whole ‘Moleskine thing’ for about 7 or 8 years now, and have looked down on the cheaper notebooks as inferior, but perhaps that is just pride, after all it is what is inside that counts. I chose this one specifically because it was cheap, I wanted to use it to record notes on a messy experiment, and knew it would get wet, and smudged, so I didn’t want to put one of my precious Moles through that, but I wonder if that desire to keep my notes clear and clean and precise is a downfall? When I first started to use the Moleskines, I only had one size: the pocket size, and I carried it with me everywhere. I put it in my back pocket, and sat on it, I had it with me every day I was working in dirty wet conditions, and the edges would get wet, and the ink would run. Just about the time I filled one up, it would start to come apart. Those first 3 or 4 Moleskines are ragged and torn, the covers are stuck on with gorilla tape, and the markers are frayed. Now I have a bit more sedate life, and more of a clean work environment, I also don’t carry my moles in my pocket, but rather in my bag (which is always with me) and so they are in much better shape when I am done with them. Conversely, I don’t use them as much; having them closer to my hand makes me more likely to use them in the few moments I have standing in line, than if I have to unzip my bag, and then open my pen case. Now I tend to use my notebooks for longer stretches, but the tendency to just fill them with instant inspiration is gone. Now when I am waiting in line, I reach for my iPhone instead. These lowly composition books are really jewels in a way that Moleskines can never be. Because they are cheap and readily available, the bar is set low, and there is no hesitation to use them. I won’t stop using my Moleskines, as they are a wonderful tool that I have grown quote attached to, but I intend to get a few more of these ordinary cheap little books, and I intend to use them.